The little wreath is just precious. I know it must have been a lot of work with all of that ribbon but it certainly is beautiful. That is simply stunning, yet so simple! It's one of those, "Why didn't I think of that?!" Well done! Thanks for linking. I'm featuring your link in this week's newsletter. This is amazing! I love it! Do you sell these? I have a friend who is getting married in October, and she is on the search for handmade lovely items. Also, I shared you last blog post on making your own ribbon on my FB and blog. This is beautiful. I love the roses. I definitely want to try this. WOW! It's so tiny! I love it! I feel like I'd go crazy making something that small. Very nice. The tiniest, cutest wreath ever!! This is incredible! Thanks for linking up! I am featuring this tomorrow on my site! 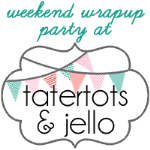 I featured this as part of my Open House wrap up! I love this Carolyn! And don't worry, you're definitely not the only one who'd save a empty tape roll! Thanks so much for sharing on Craft Schooling Sunday! Tiny and beautiful. 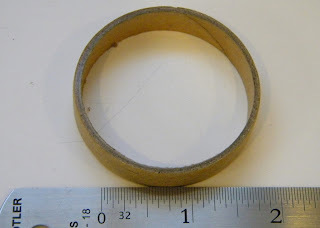 I love the idea of a tape foundation for a wreath foundation. How cute is this! Thanks for sharing! What a nice wreath. I love this color! Thanks for linking up for Friday Favorites last week! 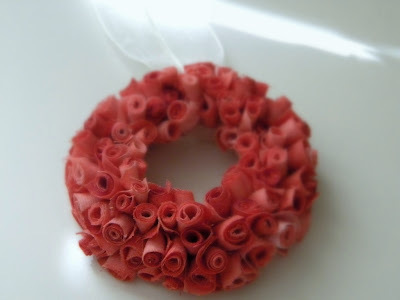 This is so lovely at first I thought it was a rolled paper wreath, I love that it's ribbon and that you made it. What a sweet little wreath. I love the ribbon roses. Just precious! I love miniature things, and this wreath is no different! And I love that ribbon, great job! Stopping by from Someday Crafts. THis is so itsy bitsy stinkin' cute! Thanks for sharing! omg i luv luv it, wow can I send you my addy? BEAUTIFUL! I would love for you to link up to my Ten Buck Tuesday link party! How incredibly cute! I'm going to have to put this in my idea bucket...I go through tape like crazy! I save tape rolls and such. You never know what kind of crafty purposes they can be put to! 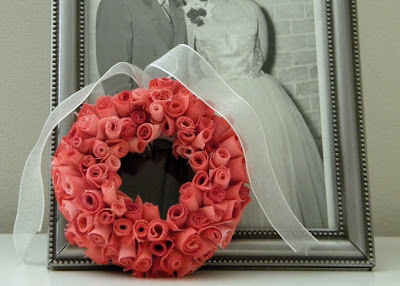 This is so beautiful, I know making all of those rosettes was time consuming! It looks like you put a lot of work into this project. I like that the wreath is mini (and recycling a tape roll is a great idea!). Thanks for sharing. Tweet, pin, stumble... gorgeous wreath!! What a beautiful little wreath and a sweet keepsake gift..love your idea. thank you for sharing.